“Hey, look what I found, Marian.” My sister Janice ceremoniously lifted a booklet from a plastic bin in Aunt Ruthie’s attic and pushed it toward me so I could have a closer look. I recognized the cover, handmade of Valentine cutouts and colored strips of paper. My memory of making it though was as faded as the strips of red construction paper. Yes, indeed, Grandma Fannie Longenecker got a keepsake from me for her 77th birthday on August 22, 1968. 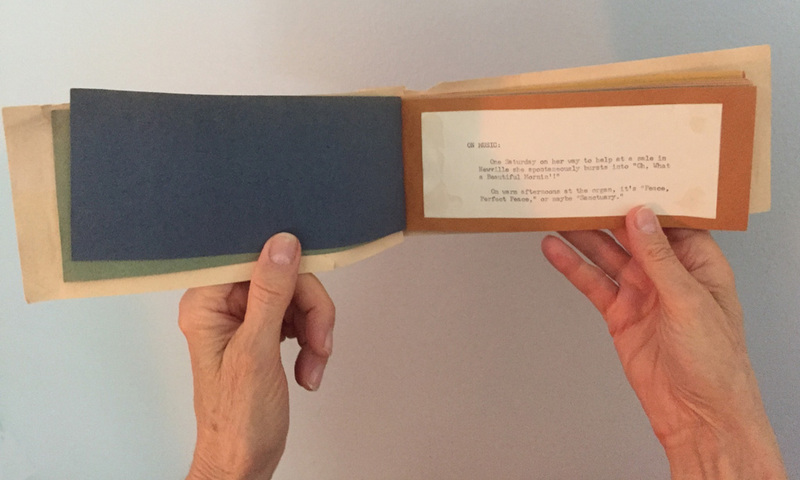 Married one year and far away from the home place in Pennsylvania, I honored my Grandma with pages gleaned from journals I kept from 1962 – 1967, a college girl turned teacher. I had forgotten I gave it to her until it was unearthed when we cleared out Ruthie’s house this spring preparing for sale. Lo, and behold, there it was, a cover aged forty-nine years with my style of calligraphy, decorated with a heart cutout.The booklet was intact but the pages were barely readable, each page scripted by the keys of my Royal typewriter. The pages open here now, un-retouched, the truth intact, complete with typos and wonky spacing. Grandma is the only one I know who can look regal with an unmatched (polka-dotted) extension to her cape dress belt. Obviously, I was proud to be a missus, having married in August of the previous year. What Grandma looked like four years later in 1972 at age 81. I have a pile of spiral-bound journals from my single days unearthed during our move last summer 2016. I know I’ll have other surprise “finds” inside them when I carve out time to peruse the pages. At the moment, I feel pulled in two directions: Pushing forward with my memoir manuscript and/or pausing to reminisce in just this way. Maybe both are possible. Have you found some creation – handiwork, notebook or something else – that you found in a surprising place? We wonder what it was, where you found it, what it means to you now. Or, has someone thanked you for a gift you had forgotten you gave? Give us all the juice please! This was lovely, Marian. You were a memoirist even then! 🙂 I enjoyed reading your Grandmother’s observations. I liked her remark about the flowers and the stars. Oh, and also about not wasting energy on putting away the kettles sometimes. 🙂 She sounds like a wise woman. Cliff says “Thank you!” He also commented below about the odd way of finding this sketch and the one of my brother Mark you may have seen on Facebook. I always knew she was wise, but the lack of common sense we observe in our culture simply underscores it. Thanks for being “numero one” in comments again! i had Merril’s thought about your early love of reminiscence and poignant moments. I loved all that Merril mentioned also but have to add that “look at the mint” reminded me a lot of the “consider the lilies.” Lovely post. I think I’ll link to it in my next offering on portraits. As you point out, these are poignant moments. Your comment reminds me that Grandma lived life on two levels: feet planted on the earth but mind and heart with ready access to the spiritual world. Thank you for suggesting a link, my friend, and for appreciating legacy. I am thoroughly enjoying the looks at little Lydia you provide on Instagram these days. Thanks for the notice here and the “share” on Twitter as well – hugs back to you for visiting here all these years, Sir David! It was serendipitous indeed that just minutes before her Aunt Ruthie’s Auction began that Marian just happened to see Auctioneer Rhonda open two large blank sketching papers taped together, wondering what was inside. 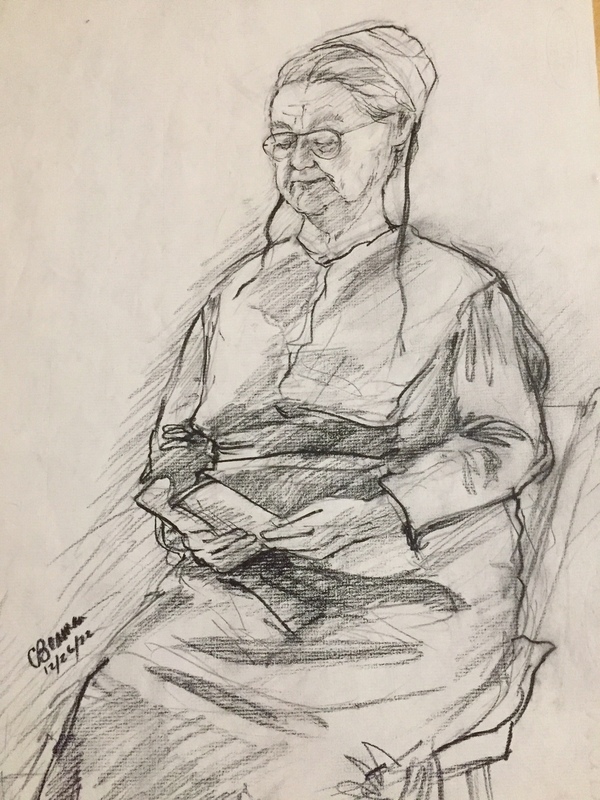 And there they were…a charcoal sketch of her Grandmother Fannie that I had done at Christmas time of 1972 and three drawings of other family members drawn in 1973. They may have ended up in the trash pile! Thanks to the sharp eyes of sales assistants at Miller & Siegrist Auctioneers, these fragile and inconspicuous drawings did not hit the dustbin. How lucky I am to display your original artwork here – thank you! Hi Marian, My memories of your grandmother are refreshed in my mind as I read through this blog. Although I only ever got to spend limited time with her, a few times in Rheems and on the occasions when your parents would bring her to visit my grandparents, she always left me feeling loved and anticipating the next time I’d get to see her. I’m so thankful for the heritage we have in the lives of those who brought us life…your grandmother was one of those I am grateful for. If your mother Mary’s memory is still sharp, she may recall the Longenecker sisters and our brother Mark. I enjoy seeing your photos of her on Facebook. I’m thankful she can still travel with you – and for the heritage we share. Thanks for taking the time to comment here, Howard. What a treasure this is, Marian. I loved it! I’m curious, do you still have the typewriter or was that an old photograph? I hope, in the future, you’ll let us have a peek into your journals. You can have a peek into my journals one day, of course. But first I have to curate them. I should get up at 3:45 every morning like you do! My goodness, Carol, you had a typewriter just like mine – wow! WORD does provide a font style that looks a lot like key strokes from old machines. It also has “Schoolhouse Cursive” that imitates the flowing lines I learned in elementary school. This generation would have to read it as a foreign language – almost. I’m glad you enjoy the nostalgia here. And grateful you take the time to reply too. Wow, Marian, Grandma Fanny comes alive to us through your vivid remembrances and through Cliff’s beautiful sketch. What a great team you’ve made! Thank you for sharing these delightful glimpses into Fanny’s life and into the heart of a young woman in love. Precious! Thank you for reminder to be grateful, publicly. Cliff not only has done sketches which I feature here and there, but often formats and updates old photos. He is always the second pair of eyes to scrutinize posts before they publish. He notices typos and extra spaces I’m blind to. Thanks for the warm fuzzies here today, Kathy. Aren’t grandmothers special. Yours certainly was. I really enjoyed getting to know her a bit through your words and hers. And it’s inched me closer to my own grandmothers suitcase, containing …. time will tell. Thanks, Marian. I remember chatting about your Grandmother when we met in Chincoteague. Of course, I’m waiting with bated breath to get a glimpse into the treasures of that special suitcase. Yes, time will tell. Thank you for sharing this wonderful collection. How wonderful that you collected them/drew or formatted them and that your grandmother once received and read them and that you re-found them. My favorite is the one about the way the stars come out so quietly. And the sketch…it’s exquisite. It occurred to me, reading your comment, that flecks of my grandma’s DNA are sprinkled on each page. Thank you! Grandma had such practical actions that I had forgotten how poetic her words were. Until now. Oooh, Grandma’s DNA; I love it. Also, I’m happy for you to continue exploring your treasures in this way, and waiting to ‘congeal’ it all in the memoir. How delightful her sayings are Marian, thank you for sharing them with us! They surely make my heart smile 🙂 Such keen observations from 50 years ago. And Cliff’s pencil sketch is delightful! Your comment reminds me how startling and sieve-like memory is. We live life in forward motion, but only when we slow down does it make more sense in retrospect. Thank you, Susan. Oh, Marian, you really are a treasure trove of family gems! This is so beautiful and so many wise observations! I think I like the one about flowers having their own language without speaking a word: how beautiful is that? Grandma was very plain in her dress, but she let flowers in outrageous colors express her fancy side. I remember her holding purple and white gloxinias bobbing in the breeze as my Aunt Ruthie captured the moment with her movie camera. Her fuschia and white peonies were always a riot in May. Right now I’m thankful we took the time to sift through the mountains of stuff in the attic. Otherwise, this gem may have been thrown out. A double memory loss! She kept them in terra cotta pots, but I’m not sure whether she grew them from seed or bought them at a greenhouse. With their fluted edges, they were very showy and bright. Marian — Oh how FUN is that?! I love that you turned a bookmark into a booklet. Brilliant! Maybe the cover started out as a bookmark, but it morphed into a booklet. Thank you for dubbing a faded memory as brilliant. That’s your style, Laurie, thanks! Yes, it’s getting more difficult to reach those pots on the bottom shelf. I’m always reminded of my mom in her latter years when I do that! 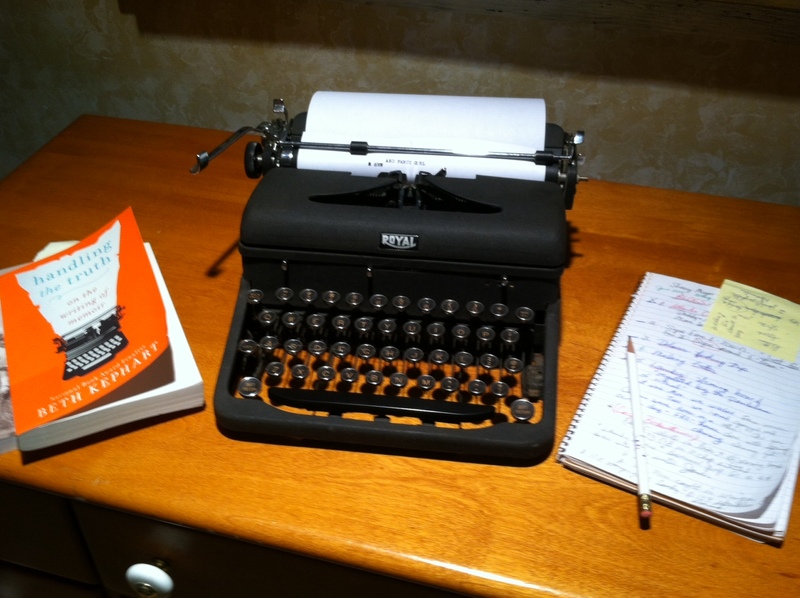 I had my typewriter stolen in Africa but the thief remembered to pull out the manuscript I had in it! You have such interesting anecdotes gathered from all over the world. Some I see on your blog. I’d like to know more about the content of your manuscript. Your Grandmother bursting into “Oh what a beautiful morning” also reminds me of my mom. (I tried to post this earlier this morning when my comment would have been 3rd in line but our IT guy had cleaned off my cookies and I was having trouble posting. Hope this works for me now! Forgive any repetition with other commenters. Intention is important in my books! You count as # 3, Melodie. Nothing to forgive. Making the transition from my sheltered life to the urban life in Charlotte, NC, my roommates branded some of my off-the-wall comments as Marian-isms. Most of them reflected my naivete. Your mother makes appearances sometimes on your Facebook page and blog. I remember her most recently as starring in a summer stock performance, looking very pleased. She seems to be an endearing character in the story of your life. Thank you for persisting in reading and replying to posts here, often a potpourri of my life’s past and current events. Yes, it was an exciting find. As a matter of fact, I can’t seem to put the booklet away even now. It’s on top of a box of other photos and letters I brought back from the house a few months ago. Grandma died in 1980, twelve years after she got this keepsake from me. Yes, it’s been around a long, long time. Thank you, Anita, for checking in here with a comment. I hope you and your family are doing well. It’s so delightful to see something in your very own hand from all those years ago Marian . How she must have loved you to keep them so beautifully. What a find . That drawing your husband has done is such a likeness because we have seen the lovely lady many times . Who cares when you post a comment. I don’t. Comments are never closed on my blog. Sometimes when I provide links, replies go back years. Thanks for mentioning Cliff’s charcoal sketch. And to think it was nearly tossed in the trash. I have no idea where it came from on the sale day OR where it was actually found it. Creativity will out! And it usually starts in childhood. Empathetic soul that you are, it does not surprise me one bit that you created handmade cards for your loved ones. Thanks you also for the compliment, Debby. To keep going, we writers need affirmation one way or another. ((( )))) back to you! What a treasure garden of quotes and a lovely keepsake. You are right, Fiona. It is a gift that keeps on giving. I’m so glad to share it here! I appreciate your curiosity and interest in nostalgia. Thank you, Diana. What treasures are held between the covers of that keepsake! How wonderful it was found during the cleaning out of Aunt Ruthie’s home. To have it now only underscores the beautiful memories you have of your grandmother. Tell Cliff I especially appreciate the likeness he brought to life in his sketch. Together, you are not only a lovely married couple but a talented and creative pair. Enjoyed this post immensely. You asked about treasures we have discovered. Many years ago, coming home from work one evening I discovered a package in the mail from a cousin on my dad’s side. She lived in Florida and although we were many years apart in age, we enjoyed a lively correspondence. Once inside I opened the package and in it I discovered some things I had no idea existed. One was a photo of my father as an infant, another of him as a young man standing on a railway crossing across the Ohio River. And lastly, an image of my dad’s father. Although these were faded and Grandpa’s stuck to a broken glass from the framing, I treasure seeing for the first time in my life what part of my family looked like, especially my dad as a younger person and an infant. I cried for quite some time that evening and could not stop looking at them. Treasures indeed. What a story about receiving these treasured images. And what a special cousin! Not everyone would go to the time, effort, and expense to mail the package. I’d say it was a gift from God. I’ll pass the compliment on to Cliff. He does fewer shows nowadays, and we’ve talked about focusing on children’s books featuring stories from my blog posts – after my memoir is further along, of course. Bless you for being a legacy-keeper! Here I am, Marion. So late, but what a reward for showing up after everyone else. This is my favorite: “It’s just like the tea out there in the garden. You don’t smell it until you tramp through it. And that’s just how it is in life.” Or maybe this: ““Do you notice how quietly night comes on? The stars don’t make a bit of noise when they come out.” What a loving Grandma and what a loving Granddaughter. The affection warms my heart. And the beautiful portrait done by Cliff. When my mother was put in a memory loss home, her husband sent me boxes of her files. One box contained every letter I wrote her in college. I began reading, but they made me angry because of her emotional neglect and my need to beg for her to write me a letter from wherever she was or tell me she loved me. Many many letters asking for her affection which never came. Sigh… I put the box in a safe place since all was forgiven on my side in that magical way forgiveness can happen from only one side. I didn’t want to dwell on the hard years at the end of her life when she needed my love. Then Vic got sick, then Mom died, then Vic died and I spent years grieving. I still haven’t read all those letters, Marion. I’m sure I will. Some day. My Grandma and Aunt Ruthie kept every single card or letter I sent them. Ever. Every missive from them proclaimed love and care. One thing I didn’t remember reading until now (or have maybe edited out) earlier was their wish for me to write oftener. When I read their letters to me, their hints were not subtle and sounded plaintive. “We are looking for a letter from you, Marian.” “Why don’t you write oftener?’ “Why, we don’t even know when graduation is,” they said. I was so wrapped up in my life: first as a student, then falling in love, then the exactions of marriage and child care. Now I’m on the other end of this spectrum and have to remind myself how absorbed my son and daughter are in their own lives now when they don’t respond to my calls or texts. For I was once thus. Your line is powerful: I put the box in a safe place since all was forgiven on my side in that magical way forgiveness can happen from only one side. Thank you for taking the time to read between the lines here, Elaine.